Whipped soap is a delicious-smelling way to get clean. The jarred soap looks like frosting (no eating, please) and feels like a body butter on skin—rich and creamy. Go for a dessert-inspired scent or try one with a crisp, fresh fragrance. Handmade in small batches in Chicago. Paraben-free and vegan. Different than I thought, but awesome! The coconut whipped soap is what dreams are made of! At first I was wondering how it was going to work, and it definitely lathers better than my old bar soap and it smells like a tropical vacation. This whipped soap is great. The scents are terrific, very fragrant. It's soft and easy to use. The jar has a wide mouth making it easy to scoop the soap onto a cloth or sponge. It makes a lot of suds so you only need to use a little. "Seaside" is one of my favorite fragrances, cool, clean, and fresh. Plus it looks pretty on the shelf! Wow, this soap is wonderful. It smells fantastic and makes lots of suds with a scrunchie. I love it. 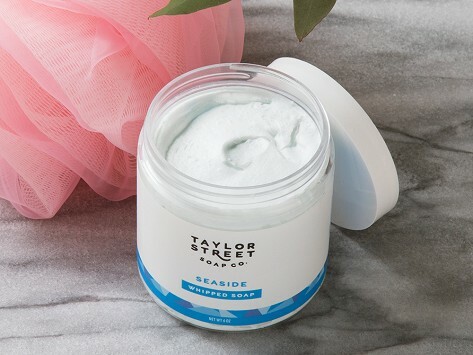 I tried the Taylor Street whipped soap in Cherry Almond. It is creamy and has a wonderful scent. Nice alternative to the usual bath wash.